A mental absence can represent a moment of life unlived and that lack of presence can have many faces: inhibition, negligence, preoccupation, delusion, disguise, or dissociation. We all know people who seem absent...listening but not really hearing, who check out and we need to understand that their behavior has an historical basis and it was there way before you were. Think of the principle expressed in the old adage, "Takes one to know one," since we perceive only what we ourselves exhibit, the inattention we note in others reflects our own unexcused absences. There is a saving grace to this: by going deeper to see the divine presence of every moment, we make our own inner potential fully present. As life presents itself on many levels, we can be present for life on many levels. We might have certain blocks about the idea of being present, of showing up. People may hesitate to reveal their true selves when past experiences didn't go as planned. 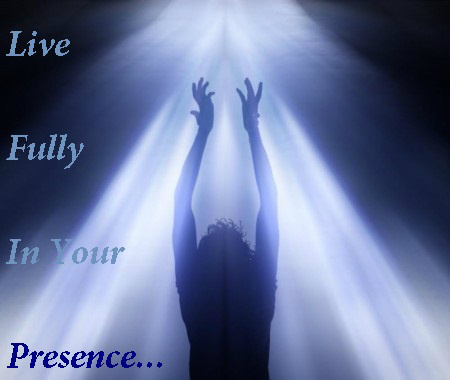 Always being in full presence might seem to require too much effort but it is not as if we only have a limited amount of energy at our disposal. We ARE energy! Anything we want to be, we must first perceive. The fact that a certain higher source exists in the world, instructs us that higher truths are to be found within us as well. It is said that "nothing is ever manifested in an effect that is not in the cause." At TAC, we beleive that the truest desire is to be fully present, to recognize the beingness of the world in all we see, to know that everything reflects a higher order, vibrating with connection and meaning.